The river Thames is facing growing pressures as a result of rapid population growth, intensive agriculture, climate change and water resource challenges. The impact on water quality, chemistry and ecology needs to be fully investigated, especially during a time of rapid water quality improvements in the lead-up to implementation of the EU Water Framework Directive. The river Thames is the largest river that is wholly in England, with a total length of 354km. The Thames basin contains many major urban centres, including London, Swindon, Oxford, Slough, Maidenhead and Reading, housing a fifth of the UK population. Some of the tributaries and the lower Thames are therefore heavily impacted by sewage pollution. 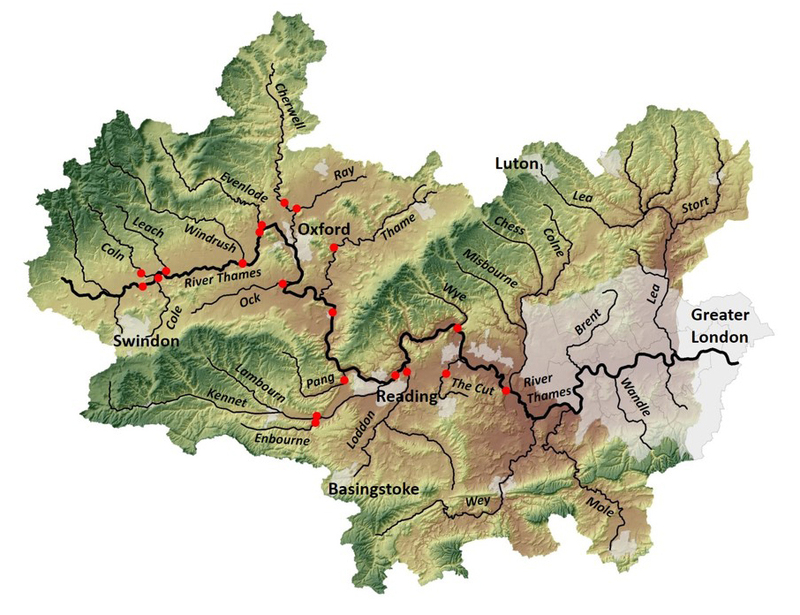 However, the upper Thames and many of its tributaries are relatively rural, and have good water quality and ecological status. The river Thames basin is facing growing pressures due to rapid population growth, intensive agriculture, climate change and water resource challenges. CEH has been conducting water quality monitoring of the Thames and many of its tributaries since 1997. This monitoring has been expanded in recent years through our Thames Initiative, to allow changes in water chemistry and ecology to be fully investigated. This chemical and biological monitoring programme provides a research platform to support a wide range of cross-disciplinary science both within CEH and externally. It currently supports collaborative external projects ranging from nutrient pollution modelling, assessment of novel in-situ analyser technologies, pharmaceutical pollutants, microbial metagenomics studies and nanoparticles. All 23 sites have been continuously monitored at weekly interval since 2009 for a full range of chemical water quality determinands. Analysis is conducted at the Wallingford Analytical Chemistry laboratory. Nutrient auto-analysers have been deployed on the River Kennet, Enborne and The Cut, to provide hourly phosphorus and nitrogen concentration data. This is used to investigate diurnal cycling, and nutrient dynamics through storm events. CEH scientists can interpret these data sets to provide unique insights into biological cycling and pollution sources. High-frequency physical, chemical and biological monitoring began at our new monitoring station at Goring in spring 2014, in collaboration with the Environment Agency. This research should provide unique opportunities to identify the controls on the annual phytoplankton bloom. CEH’s river research programmes have routinely monitored water quality at weekly interval, rather than the more usual monthly interval, as weekly sampling captures important high flow events over the course of the annual cycle. This is vitally important, as it provides more accurate pollution flux estimations and gives insights into flow-related processes. However, weekly sampling offers no information on daily cycling patterns and changes in nutrient concentrations through individual storm events, which can be vital in understanding nutrient sources and how the impact on river ecology. Since the mid 2000s, nutrient hydrochemists at CEH have been leading this new field of research by deploying a range of newly-developed nutrient auto-analysers across the Thames basin, in collaboration with the Environment Agency. A number of hourly phosphorus concentration time series along the River Kennet have been used to quantify instream biological productivity and diurnal P cycling (Palmer-Felgate et al, 2008). Simultaneous hourly monitoring of sewage effluent inputs and the downstream river concentrations were used to confirm that the poor ecological status of the upper River Kennet was not caused by intermittent sewage treatment works failures (Bowes et al, 2012). 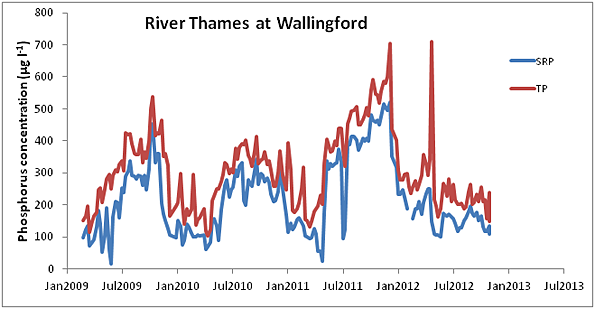 High-frequency physical and chemical monitoring of the River Enborne and The Cut during the LIMPIDS project (in collaboration with the Environment Agency and Reading University) have allowed diurnal cycling to be investigated in these contrasting river typologies (Halliday et al, 2014; Wade et al, 2012). The density of data produced within these monitoring programmes has also allowed nutrient sources to be determined, by scrutinising nutrient concentration and flow relationships through each month and even individual storm events. This novel approach has allowed sources of phosphorus and nitrogen to be apportioned at high temporal resolutions (Bowes et al, submitted). Bowes M J, Gozzard E, Newman J R, Loewenthal M, Halliday S J, Palmer-Felgate E J, et al. Characterising phosphorus and nitrogen inputs to a rural river using high-frequency concentration-flow relationships. Submitted. Bowes M J, Palmer-Felgate E J, Jarvie H P, Loewenthal M, Wickham H D, Harman S A, et al. High-frequency phosphorus monitoring of the River Kennet, UK: are ecological problems due to intermittent sewage treatment works failures? Journal of Environmental Monitoring 2012; 14: 3137-3145. Halliday S, Skeffington R, Bowes M, Gozzard E, Newman J, Loewenthal M, et al. The water quality of the River Enborne, UK: Observations from high-frequency monitoring in a rural, lowland river system. Water 2014; 6: 150-180. Palmer-Felgate E J, Jarvie H P, Williams R J, Mortimer R J G, Loewenthal M, Neal C. Phosphorus dynamics and productivity in a sewage-impacted lowland chalk stream. Journal of Hydrology 2008; 351: 87-97. Wade A J, Palmer-Felgate E J, Halliday S J, Skeffington R A, Loewenthal M, Jarvie H P et al. Hydrochemical processes in lowland rivers: insights from in situ, high-resolution monitoring. Hydrology and Earth System Sciences 2012; 16: 4323-4342. CEH has conducted a series of experiments using in-stream flume mesocosms on the river Lambourn at Boxford, the river Kennet at Mildenhall and the river Thames at Wytham, to investigate nutrient limitation of benthic algal growth. This helps determine phosphorus concentration targets that need to be attained to limit excessive algal growth and improve ecological status. The phosphorus and nitrogen concentrations in the incoming river water were manipulated within each flume by the addition of concentrated nutrient solutions. Flume phosphorus concentrations were also reduced in some flumes by the addition of iron solutions which rapidly precipitates the phosphate in the incoming river water. The resulting gradients in nutrient concentrations that were simultaneously produced were used to investigate the effect on benthic algal growth rates and to identify threshold nutrient concentrations that could improve ecological status. The impact of light intensity has also been simultaneously investigated using shading cloth to mimic dappled tree cover. These experiments have all shown that increases in P and N concentration would not increase algal growth rate. Therefore, algal blooms in these rivers are not caused by sporadic nutrient pollution incidents. However, reductions in P concentration did reduce benthic algal growth rate in the rivers Kennet and Lambourn, showing that these rivers are at the phosphorus limiting concentration. 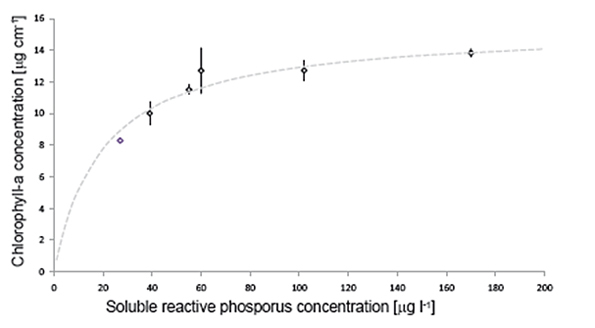 The river Thames experiments showed that substantial reductions in phosphorus concentration would be required before reductions in the algal growth rate would be observed (from the current 230 µg P l-1 to below 100 µg P l-1. However, reducing light intensity to the river by increasing shading could potentially halve the algal growth rate. Therefore, tree planting along the banks of rivers could provide an effective means of controlling algal blooms across the Thames basin. The Thames Initiative research platform includes the monitoring of total and dissolved metal species at weekly interval, using ICP-OES. This data has been used as a sewage tracer during apportionment studies, and also supports current nanoparticle research. Thames Initiative monitoring sites have also been used to evaluate a new uranium passive sampler. Concentrations of the antiviral Tamiflu and a range of pharmaceuticals were quantified across all Thames Initiative monitoring sites during and after the 2009 swine flu pandemic. The effect of Tamiflu on benthic river algae was also investigated using within-river flume mesocosms. Exposure to pharmaceutical pollution originating from sewage effluent is an unavoidable component of freshwater microbial life. Despite this, the extent to which these pollutants influence the composition and function of freshwater microbial systems remains unclear. Tamiflu is an antiviral with unprecedented projected use patterns during an influenza pandemic (Singer et al. 2008; Singer et al. 2011). The impact this pulse of bioactive drug will have on the resilience of freshwater microbial communities remains unexplored. Novel in-river mesocosms that allow for the replication and manipulation of river conditions were used to investigate the effect of Tamiflu on periphyton biofilm in a relatively pristine UK chalk river (River Lambourn, Boxford, UK). Oseltamivir Carboxylate (OC) was dripped continuously into four of the channels to maintain a minimum concentration of 1000 ng/L. Periphyton biofilms were grown for nine days on limestone tiles in four OC and four control channels. On day five (T1), seven (T2) and nine (T3) tiles were taken from all replicate channels. DNA from all tiles was extracted, amplified and sequenced on the 454 Titanium platform (Roche). Sequence data was preprocessed in Qiime on CloVR and divided into eukaryote and bacterial communities. Tamiflu (OC) exposed microbial communities were not significantly changed as compared to the unexposed controls. However, Non-metric Multidimensional Scaling showed differences between the bacterial fractions of the biofilms from timepoint one and increasing differences between the autotrophic components of the biofilms towards timepoint three. Additional analysis was provided from shotgun metagenome analysis, which indicated statistically much stronger differences in species composition between the OC and control treatments over the course of the exposure. The results suggest that Tamiflu can significantly impact the microbial community over the brief nine-day exposure period. As a pandemic will last upwards of 13-15 weeks, it remains unclear how this more chronic exposure scenario could impact river function. Research was conducted as part of a D.Phil by Katja Lehmann at the University of Oxford and CEH, supervised by Dr Andrew Singer and Prof Dawn Field at CEH, and Dr Tom Bell at the University of Oxford and Imperial College London. The results were generated in collaboration with Dr Mike Bowes at CEH and Dr David Bass at the Natural History Museum, London. Wastewater Treatment Plant (WWTP) discharge has been a well-known cause of eutrophication in many rivers, and has prompted widespread introduction of tertiary treatment. It is also a well known source of pharmaceutical and other chemicals substances, and of bacteria that have either originated in the WWTP or have passed through the system. In large rivers, dilution, photodegradation and biotransformation remove some of that contamination, but decreased flow scenarios and higher discharge rates might change the balance. In addition, bacterial communities exposed to sewage sludge have been shown to have a higher prevalence and abundance of class 1 integrons, genetic elements that carry antibiotic resistance genes. The impact of this on riverine microbial systems remains under-researched. Novel in-river mesocosms that allow for the replication and manipulation of river conditions were used to investigate the effect of sewage effluent (SE) on periphyton biofilm in two UK chalk rivers, one relatively pristine (River Lambourn, Boxford, UK), the other impacted by pollution (River Kennet, Mildenhall, UK). Sewage effluent was dripped continuously into four of the channels to maintain ≥ 2.5 ppm. Periphyton biofilms were grown for nine days on limestone tiles in four SE and four control channels. On day nine tiles were taken from all replicate channels. DNA from all tiles in both experiments was extracted, amplified, sequenced on the 454 Titanium platform (Roche), processed in Qiime on CloVR and divided into bacterial and eukaryote communities. The samples were analyzed for Class I integron prevalence to investigate the capacity for sewage to facilitate the dispersal of antibiotic resistance genes (often associated with Class 1 Integrons). ANOSIM (Analysis of Similarity) was used to provide a multivariate test statistic. The Kennet microcosms showed no significant difference between communities exposed to sewage effluent (SE) and the controls. The Lambourn and Kennet studies both showed distinctly different communities per river, but no clustering patterns or significant community differences between the SE-impacted biofilms and controls. Class I Integron prevalence in the communities exposed to SE is greater than in the control channels, and is generally much higher in the Kennet than in the Lambourn. Freshwater systems show some resilience to the impact of sewage effluent on a species level. Even in systems in which changes to the microbial system are masked by bacterial seeding from upstream, the impact of sewage can be shown by a higher prevalence and abundance of class I integrons. 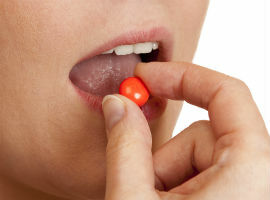 This change, which brings about greater antibiotic resistance – and all the problems this entails - should not be ignored. Heavily sewage impacted rivers like the Kennet might have a microbial system that has already adjusted to continuous heightened SE input, thereby explaining the proportionally smaller impact seen in these biofilms after exposure to additional sewage effluent. Future work will investigate the effect of different tertiary treatment options on class I integron prevalence in effluent, and the limits of resilience of riverine biofilms. Research was conducted as part of a D.Phil by Katja Lehmann at the University of Oxford and CEH and supervised by Dr Andrew Singer and Prof Dawn Field at CEH, and Dr Tom Bell at the University of Oxford and Imperial College London. The results were generated in collaboration with Dr Mike Bowes at CEH and Dr Will Gaze and Dr Greg Amos at the University of Exeter and University of Warwick. Oseltamivir carboxylate (the active metabolite of Tamiflu) is frequently demonstrated to be a conservative chemical in waste- and freshwater systems and, as such, represents an ideal tracer for the wastewater forensic epidemiology approach. Wastewater forensic epidemiology is the use of wastewater to determine health-related attributes of the target population. In this epidemiological study we evaluated the load of OC in waste water as an unbiased measure of Tamiflu consumption during an influenza pandemic. The OC levels in influent of two waste water treatment plants (WWTPs) located at Benson (51.61562, −1.10945) and Oxford (51.71384, −1.21545), in Oxfordshire, England, were measured during the peak of the 2009 Influenza A(H1N1)pdm09 pandemic. Measured OC was compared with two complementary sources of national government statistics to assess compliance rates (the difference between the amount of Tamiflu prescribed and dispensed and the amount of drug actually consumed). Predictions of oseltamivir consumption from detected levels in wastewater influent were compared with two sources of national government statistics to derive compliance rates. Scenario and sensitivity analysis indicated between 3–4 and 120–154 people were using oseltamivir during the study period in the two WWTP catchments and a compliance rate between 45–60%. With approximately half the collected antivirals going unused, there is a clear need to alter public health messages to improve compliance. We argue that a near real-time understanding of drug compliance at the scale of the waste water treatment plant (hundreds to millions of people) can potentially help public health messages become more timely, targeted, and demographically sensitive, while potentially leading to less mis- and un-used antiviral, less wastage and ultimately a more robust and efficacious pandemic preparedness plan. Research was led by Dr Andrew C Singer at CEH with co-authors Drs Josef D Järhult, Roman Grabic, Ghazanfar A Khan, Ganna Fedorova, Jerker Fick, Richard H Lindberd, Mike Bowes, Björn Olsen, Hanna Söderström. Please contact Dr Andrew Singer on acsi@ceh.ac.uk for further information. Phytoplankton community composition is determined at weekly interval across all monitoring sites using flow cytometry. This analytical method produces cell counts for ten different classes of phytoplankton, including diatoms, nano- and pico-algae, cryptophytes and cyanobacteria. A staining technique is also used to enumerate and differentiate bacteria with high and low nucleic acid content. This has generated a unique high resolution (weekly), multi-site (22 sites across the catchment) overview of the populations of the major eukaryotic and prokaryotic plankton groups across this critically important river catchment. Through this we seek to understand the major physiochemical drivers of the occurrence of blooms of diatoms, chlorophytes, picoeukaryotic algae and cyanobacteria, as well as heterotrophic bacteria. In addition to flow cytometric characterisation of plankton populations, a concurrent archive of filtered water samples is being collected. Samples collected on glass fibre and 0.22 µm membrane filters are stored at -80°C for later DNA extraction and later downstream molecular analysis. We are currently using this DNA archive to allow us to better understand the composition of the bacterial and eukaryotic plankton communities2 using high throughput sequencing (HTS) in-house at CEH. Additionally, this archive can later be probed for the occurrence of particular groups of bacteria or their genes of interest, for example pathogens, antibiotic resistance genes and cyanotoxin genes. Plankton samples are routinely taken from monitoring sites across the Thames catchment at weekly intervals, and stored at -20°C. This provides a DNA archive that can be used for subsequent molecular analysis, such as qPCR or next generation sequencing. Please contact Dr Dan Read on dasr@ceh.ac.uk for more information. 1. Read D S, Bowes M J, Newbold L K, Whiteley A S (2014) Weekly flow cytometric analysis of riverine phytoplankton to determine seasonal bloom dynamics. Environmental Science: Processes and Impacts. 2. Read D S, Bowes M J, Newbold L K et al (In prep) Catchment-scale drivers of bacterioplankton community structure in the River Thames, UK. 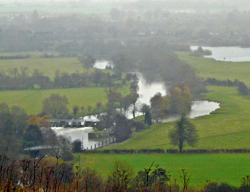 Monitoring of the river Thames began in April 1997 at Days Lock, Dorchester, Oxfordshire, as an initiative by the Institute of Hydrology (now CEH). Prior to the current Thames Initiative, we monitored the chemical water quality of the Thames and tributaries through NERC programmes such as LOCAR and the Land-Ocean Interaction Study (LOIS). This was a period of rapid change due particularly to improvements in sewage treatment drastically reducing phosphorus concentrations in many rivers. Much of these past data are available through the CEH Environmental Information Platform (requires registration). Such monitoring provided river water quality data for a major southern river system, as an extension to the eastern UK rivers (Humber to the Tweed) monitored under LOIS. Understanding and identifying nutrients inputs from a mixed agricultural and urban catchment and issues of eutrophication and associated ecological and water quality impairment provided the main stimulus for the initial phase of Thames monitoring. Shortly afterwards, in June 1997, monitoring began on a tributary of the Thames, the River Kennet, to evaluate the water quality impacts of sewage effluent, and the effects of the introduction of tertiary effluent treatment (‘phosphorus stripping’). The Thames tributary monitoring was further extended in July 1997 to include the Pang and Lambourn and in 1998 with the Thame, followed by the Cherwell and Ray in 2000. From 2000-2006, a major NERC thematic initiative, the Lowland Catchment Research programme (LOCAR), focused on the Pang and Lambourn. LOCAR brought together key interdisciplinary hydro-ecological and hydrochemical research to better understand the movement of water and nutrients and their ecological impacts, within permeable lowland catchments. In 2008 CEH’s research on the Lambourn expanded with the establishment of the Lambourn River Observatory. The current Thames Initiative project was established in 2009. The data are freely available through the CEH Information Gateway (Data set titled UK Lowland River Chemistry) and can also be accessed through the supplementary information accompanying Neal, C; Bowes, M; Jarvie, H P; Scholefield, P; Leeks, G; Neal, M; Rowland, P; Wickham, H; Harman, S; Armstrong, L; Sleep, D; Lawlor, A; Davies, C E, Lowland river water quality: a new UK data resource for process and environmental management analysis. Hydrological Processes 2012, 26, (6), 949-960. The Analytical Chemistry laboratories at our Wallingford site provide high quality chemistry data for the Thames Initiative project.